A great day for a run around the race course and surrounding parklands - lots of lovely people working together to support the process of finding cures for all types of Cancer. I smashed my goal of 1.20 and got round in 1 hour and 4 minutes, the local rag caught me at the finish line looking a little worse for wear! 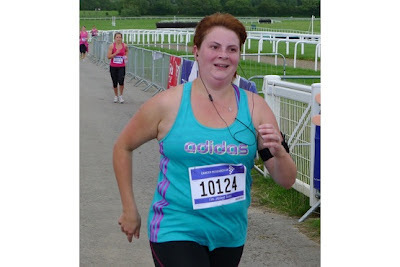 I think my photo above is a little better as I'd drank a bottle of water and had an ice lolly by then!!!! Guess what - I've already signed up for next year too! Congrats on finishing the race in your record time! Well done Chloe, thats great.